A popular non-denominational Welsh language periodical that published serialised novels alongside articles on antiquities, literature, music and science. The periodical was edited by the journalist and dramatist, Beriah Gwynfe Evans (1848-1927), with the musician William Thomas Rees (Alaw Ddu, 1838-1904) serving as deputy music editor. 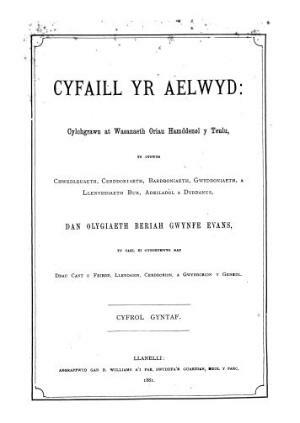 Associated titles: Cerddor y Cymry (1886-1888); Cyvaill yr Aelwyd (1888); Cyfaill yr Aelwyd a’r Frythones (1892).